Antonio Bazzini was an Italian violin virtuoso, composer and teacher whose 200th anniversary was celebrated on the 11th March 2018, although some quite distinguished violinists, including Yehudi Menuhin, Jascha Heifetz and more recently Gil Shaham and Maxim Vengerov, have recorded his music, his main claim to fame is that he gave the première performance of the Mendelssohn Violin Concerto at a private concert with the composer at the piano. He is also noted as being the teacher of many Italy’s greatest composers of the late nineteenth century including Pietro Mascagni and Giacomo Puccini. Whilst he was also asked by Verdi to compose the Dies Irae section for the Messa per Rossini. Bazzini composed six quartets in all, and I hope this disc marks the beginning of a complete cycle; there is a complete recording on Dynamic (CDS 418/1-2), which was favourably reviewed by Christopher Howell in February 2003. The only other recording of his music that I have is one of his music for violin and piano performed by Luigi Alberto Bianchi and Aldo Orvieto on another Dynamic disc (DM8018), which I have enjoyed. The quartet writing is attractive if a little conservative, listening to them it is hard to believe that the C Major was composed as late as 1864. They are clearly influenced by his passion for the Germanic school of quartet writing many of which, according to Boito, he was use to performing, but these influences are clearly from the late classical and early romantic periods and show little Italianate inspiration. Both quartets show that Bazzini was both accomplished and adept at writing for the medium of the string quartet, with each instrument being given their own brief solo section in the works. The C Major Quartet, like the other presented on this disc is cast in four movements, with the first movement opening with a slow introduction in which the main theme is stated before the entry of the faster section at 1:45, when the theme becomes the linking factor between the two sections. In this Quartet the slow Andante sostenuto is placed second and contains some lovely melodious and lyrical passages. The opening of the third movement Scherzo allegro vivo is akin to Mendelssohn’s writing for A Midsummer Night's Dream before opening out into a more expansive second theme. The final movement contains some fine writing for the quartet, with the Germanic influences coming through strongly in this almost triumphal ending of the Quartet. I agree with Christopher Howell that the E flat Major Quartet is a much stronger and accomplished work than No. 1. As already stated, it begins with a slow opening to the first movement, with the second quicker theme coming in at 2:13, this time though this theme differs from the main theme of the slower section. This is followed by a graceful Minuetto reminiscent of the great Italian composer of string quartets of the classical period, Boccherini, although without the usual repeated sections. The slow movement comes third in this Quartet, which takes the main theme and develops it into “a sort of theme with variations”, which is quite effective. The final movement is the most technical of all the movements on this disc, it makes good use of the capabilities of all four instruments and demands from them some complex interplay between the musicians. 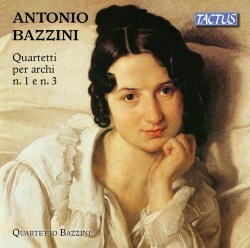 This is a fine disc of music from one of the few noteworthy non-operatic Italian composer of the nineteenth century, it clearly shows that Bazzini was a skilled exponent of quartet writing, especially in the 3rd Quartet, which in this performance should win some new converts to his cause. The Quartetto Bazzini play this music with a great sense of style and energy, especially in the E flat Major Quartet, there is great ensemble work here and in the final track on this disc they really shine. It is a shame that the booklet notes, in Italian and English, do not mention the Quartetto Bazzini, as some background to the quartet would be nice, they do however, give a good introduction to the composer and his period as well as to the quartets presented here. The recorded sound is very good, with the quartet being captured in an acoustic that allows each instrument clearly to be heard. A must for all fans of the string quartet, especially those off the beaten track.